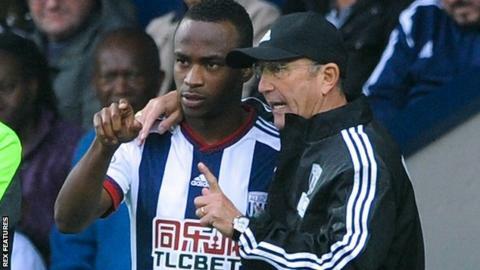 West Brom striker Saido Berahino has "wasted three or four months" of his career, according to Baggies boss Tony Pulis. The 22-year-old forward suggested he would not play for Baggies chairman Jeremy Peace again after a move to Tottenham was blocked last August. He has again been linked with a move in the January transfer window. "It's been dreadful to have an outstanding player who has dropped off because of circumstances," said Pulis. "It has not helped us at all. "If he's still here [after January], he's got to start realising that this is affecting everybody. He's got to get back to what he was. "Saido has to realise he is a footballer. In my opinion, he has wasted three or four months and he can't afford to waste any more time." Berahino has made 18 league outings for West Brom this season, with 10 as a substitute, and scored three goals. "I'm not picking him because he's not been anywhere near what he was last year," added Pulis. "You have to make him understand that we are playing at the top of our profession and every week you have to be at the top of your form. Unfortunately, that hasn't been Saido, mentally or physically. "I like the kid, I spend a lot of time with the kid but my biggest worry with him is that he has so many other people out there who influence him." What is going on with Berahino? Read more on Saido Berahino: Will West Brom sell striker in January?